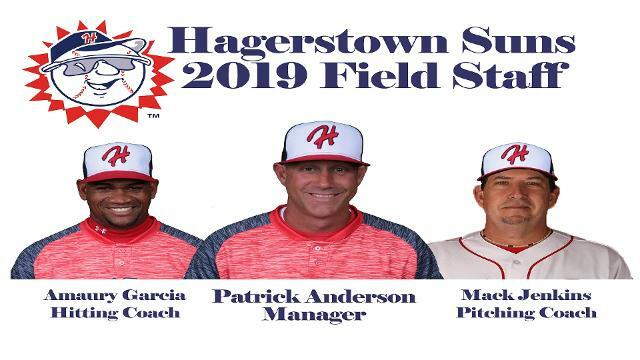 HAGERSTOWN, MD (January 7, 2019) – The Suns, along with the Washington Nationals, are announcing their 2019 field staffs today. In the South Atlantic League, there is no surprise about the skipper in Hagerstown, Patrick Anderson. The manager is in his sixth season with the Suns and has a franchise record 363 wins under his belt. In addition to Anderson, athletic trainer Darren Yoos and hitting coach Amaury Garcia will also return to the Hub City this season. They will be joined by pitching coach Mack Jenkins and strength and conditioning coach Will Lindholm. Anderson has led the Suns to two playoff berths in his five seasons at the helm, including a 2014 trip to the South Atlantic League Championship Series. In Anderson’s lone season in the Nationals’ system before coming to Hagerstown, he led the Gulf Coast League Nationals to a league championship and their best winning percentage in team history. His career began as a hitting and catching instructor in the Royals system from 2001-2008 before he took a break from affiliated ball to accept his first head coaching job at Hofstra University, where he stayed from 2009-2012. Garcia is the longest tenured Suns coach behind Anderson. 2019 will be the hitting coach’s fourth season with the organization. Last season, he led the team to a .317 on-base percentage, which was helped by the offense recording the third fewest strikeouts in the South Atlantic League. The Dominican Republic-native appeared in 10 games for the 1999 Florida Marlins before beginning his coaching journey. 2019 marks Yoos’s second season in the Hub City and seventh in the Nationals’ system, with the previous five with the Auburn DoubleDays. The Watertown, Connecticut-native began his career in his hometown as the Head Athletic Trainer for Watertown (CT) High School from 2008-2011. The 2008 Southern Connecticut State University Graduate also served in the Red Sox Organization with the Double-A Portland Sea Dogs in 2012 to begin his MiLB journey. While Jenkins may be new to both the Suns and the Nationals organization, the 2019 pitching coach has plenty of experience after spending the last 32 seasons with the Cincinnati Reds, including 2016-18, where he was the Major League pitching coach. Jenkins joined the Reds in 1989 as a Minor League pitching coach. He climbed through the system over the course of 16 years, beginning at Rookie-level Billings (1990-91), with stops in Single-A Cedar Rapids (1992), Single-A Charleston (1993-95), Double-A Chattanooga (1996-2001) and finally finishing in Triple-A Louisville (2002-05). After that, he was the Reds Minor League pitching coordinator from 2006-2011 before he held roles as the assistant pitching coach and bullpen coach for the Major League team from 2012-2016. The final member of the 2019 field staff is the strength and conditioning coach, Lindholm. Lindholm joined the Nationals organization with the Auburn DoubleDays in 2018. In 2019 the Suns will welcome a talented team of Nationals prospects for 70 home games at historic Municipal Stadium in Hagerstown. Season tickets and 10-game plans are now available. To purchase tickets or learn more about the Suns ticket plans and promotions for the 2019 season, call 301-791-6266 or visit www.hagerstownsuns.com.